After much anticipation, the first teaser trailer for Spider-Man: Far From Home was released to much fanfare this morning. 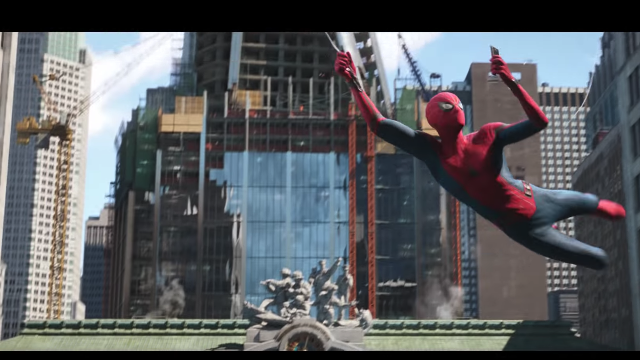 Beyond offering a glimpse into Spidey’s next solo outing, the new footage gives us our first look at life in the MCU following the events of Avengers: Endgame. 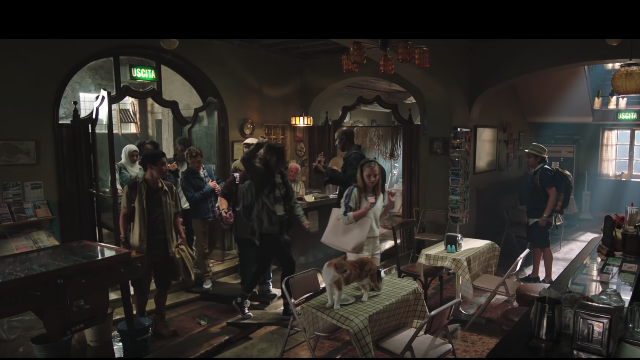 Although the trailer gives a few hints about this and provides us with the long-awaited reveal of Jake Gyllenhaal’s Mysterio, it largely focuses on Peter and his schoolmates’ summer trip to Europe. There’s a lot to unpack here, so let’s jump right into it! 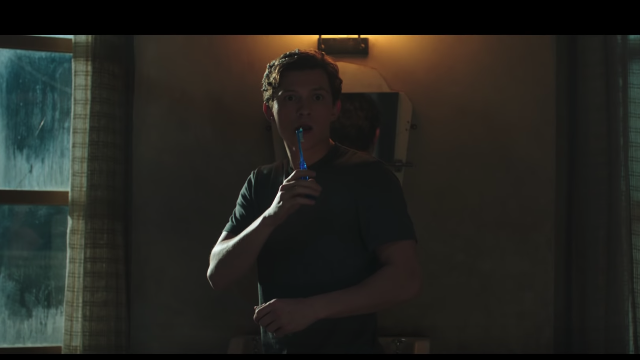 The trailer’s opening gives us an idea of what Peter’s been up to after the planet’s run-in with Thanos. It’s clear that he’s been using his costumed alter-ego for a good cause by helping to raise money for the homeless. 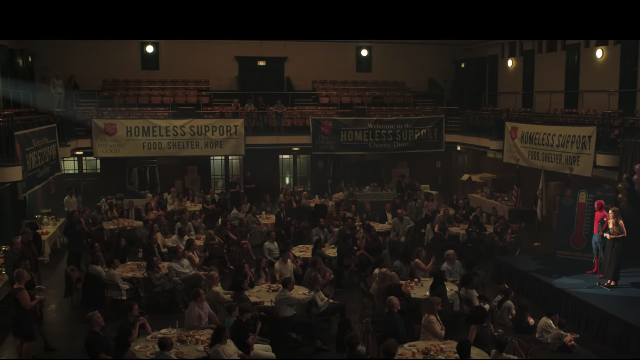 Aunt May appears to be in charge of the event, mirroring her character’s charitable work in Spider-Man PS4. 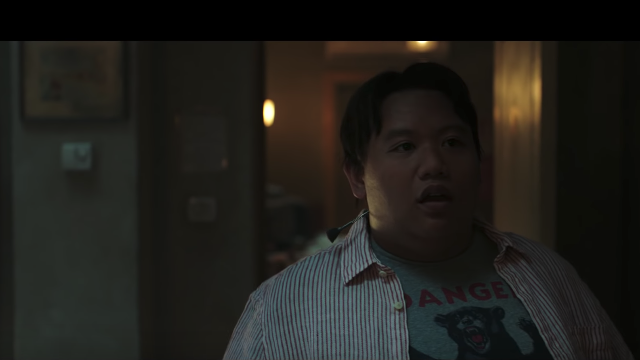 It’s also good to see that May has warmed up to the fact that her nephew is a superhero after her less-than-enthused reaction at the end of Spider-Man: Homecoming. 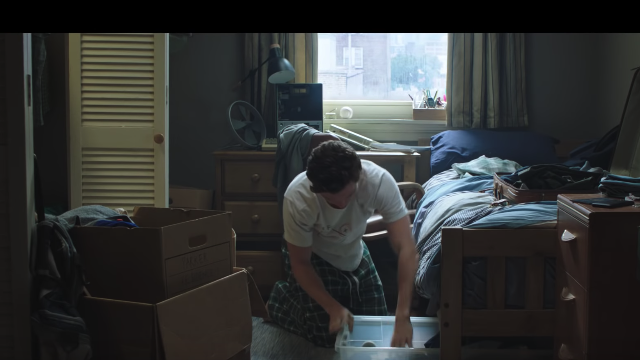 We also get a quick shot of Peter’s bedroom, which looks different from his room in Homecoming. The boxes hint that the Parkers may have recently moved, which suggests a lengthy amount of time has passed between Endgame and Peter’s latest adventure. We’re also treated to a new interaction between Peter and Mr. Delmar, a.k.a. the man behind the best sandwich in Queens. Though his deli was destroyed in Homecoming, he seems to have bounced back with minimal fuss. 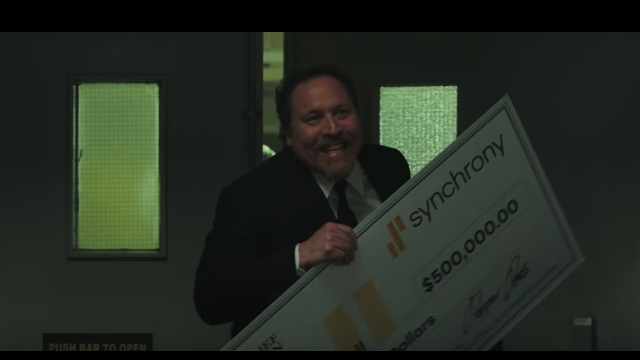 Could Tony Stark’s deep pockets have had something to do with this? Here, we have a cool shot of Spidey doing Spidey things. Aside from the fact that he’s snapping selfies while zipping around Manhattan, you’ll also notice that this spot was epicenter for the Battle of New York. A statue to commemorate the servicemen who lost their lives during Loki’s onslaught lingers in the background, but you’ll also notice that there’s a new skyscraper being constructed in the exact spot where Avengers Tower once stood. Since Tony sold the building in Homecoming, it’s anyone’s guess as to what’s being erected in its place. Is Norman Osborn finally setting up shop in the Big Apple? Next, we get a shot of Peter’s new passport, complete with his awkward photo. If you look closely at the dates of issue and expiration on the passport, it’s pretty obvious that the years have been erased in this shot to avoid spoilers–a classic case of Marvel misdirection. 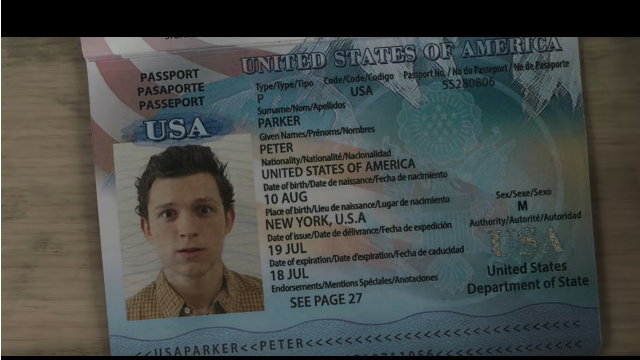 Also, the passport lists Peter’s birthday as August 10, the same date that Amazing Fantasy #15 went on sale in 1962. 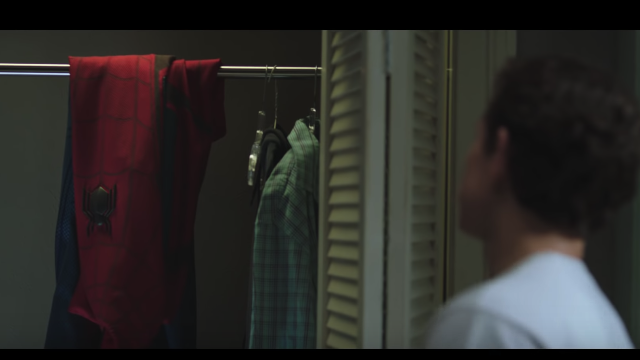 Peter ultimately decides to leave his costume at home before heading to Europe so he can fully enjoy his summer vacation. 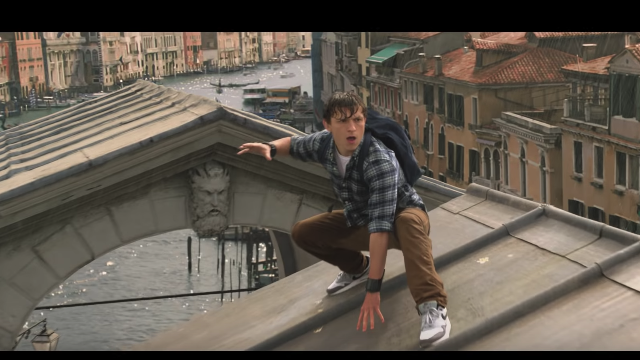 Plus, if MJ, Flash, and his other Midtown High classmates see Spider-Man gallivanting around the same countries they’re visiting, how hard could it be for them to put two and two together? This is also a great way to justify why Peter is getting a pair of new suits in Far From Home. 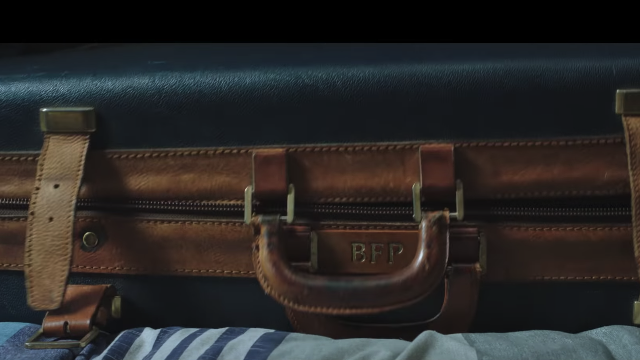 Another shot of Peter packing gives us a closer look at his suitcase, which is engraved with the initials “BFP.” As if there were any doubt, this is an obvious nod to Peter’s Uncle Ben, who has yet to be formally mentioned in the MCU. It’s a great little touch that acknowledges Peter’s love for his uncle without retreading the same great power/great responsibility trope that was beaten to death over the course of two franchises. 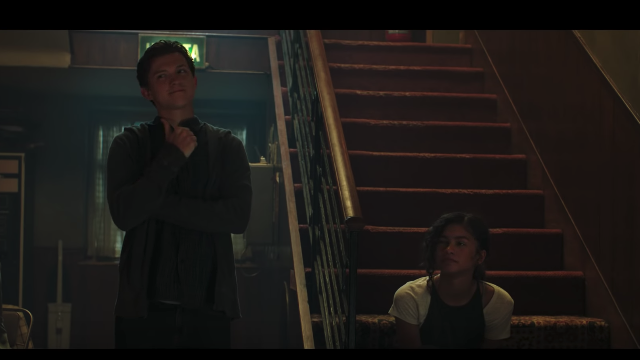 In this pair of shots, we get our first glimpse at Peter and MJ’s developing romance. 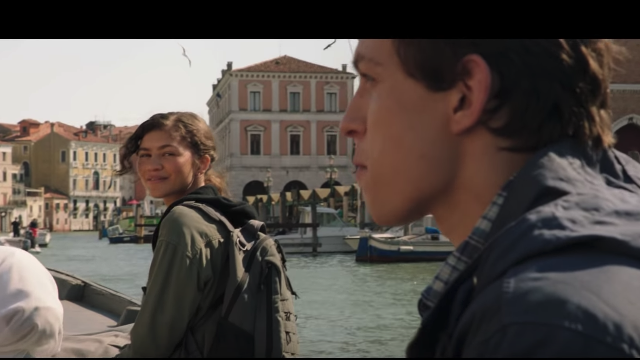 From the looks of things, it seems that Peter and his schoolmates will be spending the first leg of their trip in Venice, a perfect spot for young love to bloom. 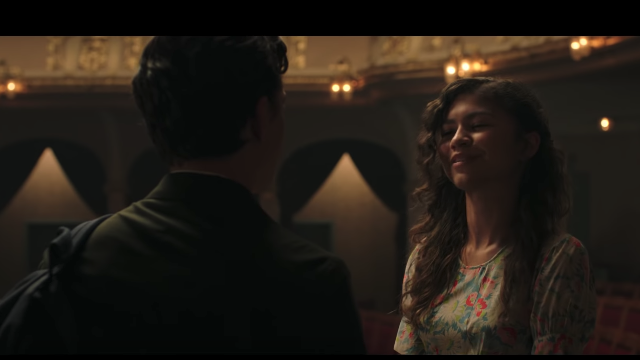 This might not be the MJ that fans were expecting, but the chemistry between Tom Holland and Zendaya is undeniable and it’s great that the trailer shines a light on their characters’ budding relationship. Despite his apparent confidence as Spider-Man, it’s charming to see that Peter is still a dork when it comes to girls. 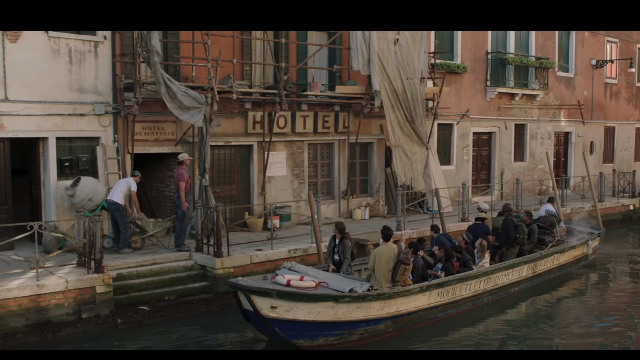 These two shots presumably show us where the kids are staying while in Venice, which looks a bit rinky-dink for the characters. Notice the cat in the foreground. 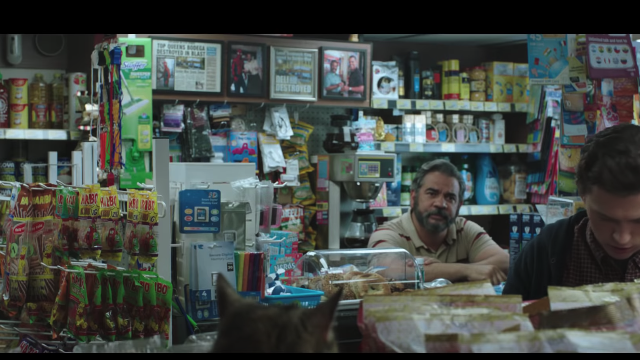 It doesn’t look like Captain Marvel‘s Goose, but perhaps another Flerken is making its MCU debut in Far From Home? 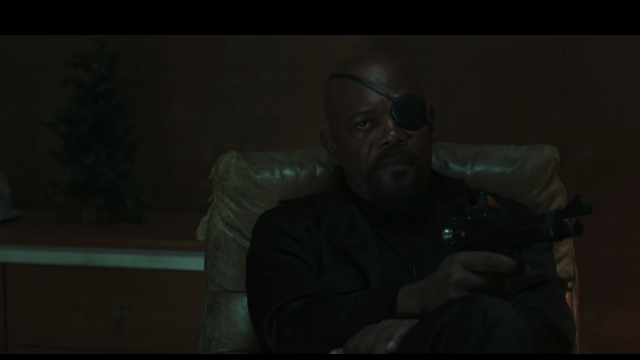 Time will tell, but it’s an odd coincidence considering that Nick Fury eventually shows up here to make contact with Peter. 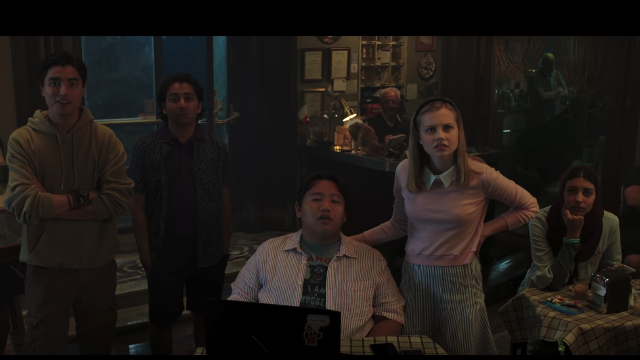 In the trailer, we see Ned trying to give Peter dating advice before he’s abruptly tranquilized by Nick Fury. Now that the characters are finally meeting face to face, we have to wonder if their conversations will be marked by antagonism like in Marvel’s Ultimate Spider-Man comics. It’s hard to say exactly what the always mysterious Fury is here for, but it’s kind of hilarious to know that after 10 years, the erstwhile S.H.I.E.L.D. director still has no problem showing up unannounced in people’s homes in the middle of the night. We also get Peter’s deer-in-the-headlights reaction shot, which Holland pulls off so well. Fury’s reputation precedes him, so Peter’s response feels appropriate here, even if Fury is somehow upset with him. 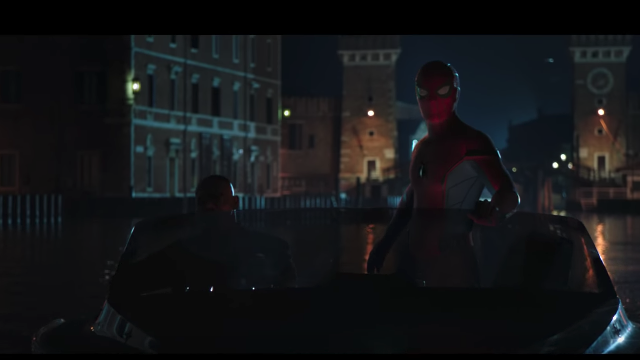 Here we see Fury and Spider-Man on a late-night boat ride along some European canal. Peter is clearly wearing his classic red and blue threads, so leaving his suit back in New York proved to be a futile gesture and all signs point to Fury bringing the suit with him. 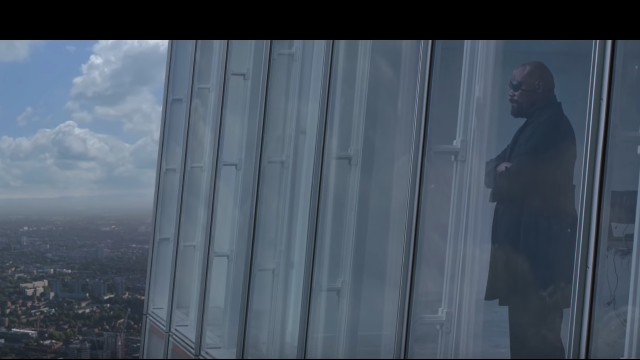 Another shot shows Fury looking out from a skyscraper over what appear to be London city streets. It’s admittedly hard to tell where he is here, but it’s definitely not Venice. 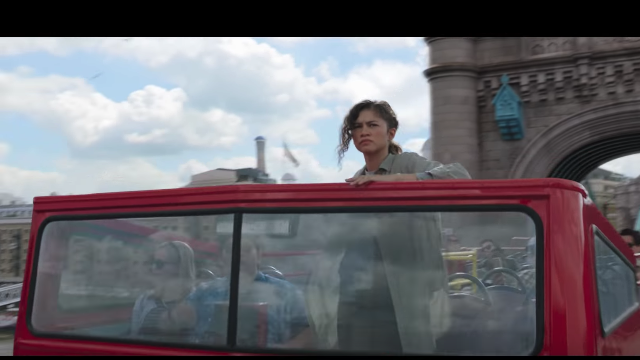 The next section of the trailer highlights the group’s exploits in London, starting with this shot of MJ, Ned, and Betty Brant on top of a double-decker bus. It’s possible that this precedes the London action sequence since Peter is nowhere to be found this scene. It’s also worth mentioning that Betty and Ned are sitting next to each other on the bus. Since their comic book counterparts got married in the ‘70s, could an onscreen romantic tryst be in their future? 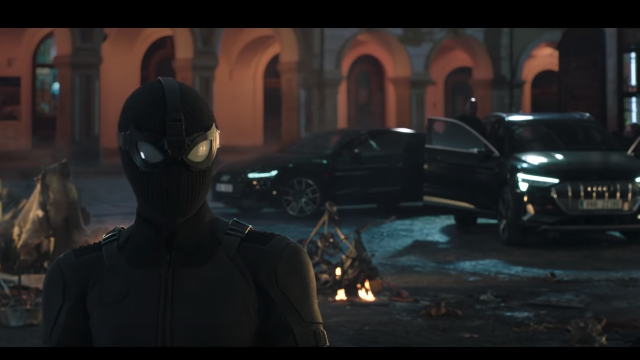 In these three shots, we see the new black and red suit in action. 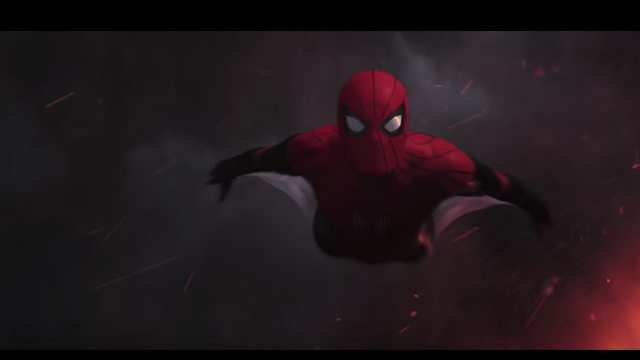 It seems to follow the same basic design that we saw int the first film–web wings and all–but who exactly modified the suit is still unknown. 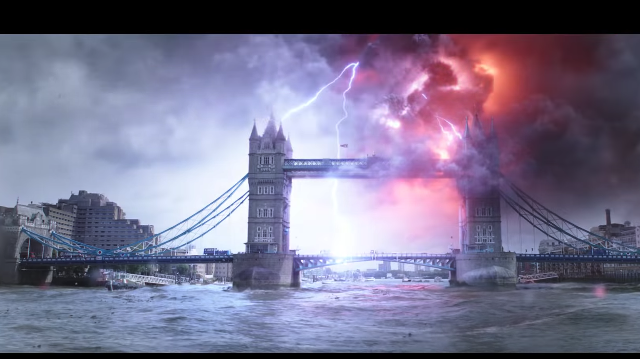 This also seems to be from the same London set piece, but the nature of the explosion depicted in this scene isn’t clear. Is this the work of the Elementals or possibly someone else working with them? Whatever the Elementals’ plans are, they put entire cities at risk. 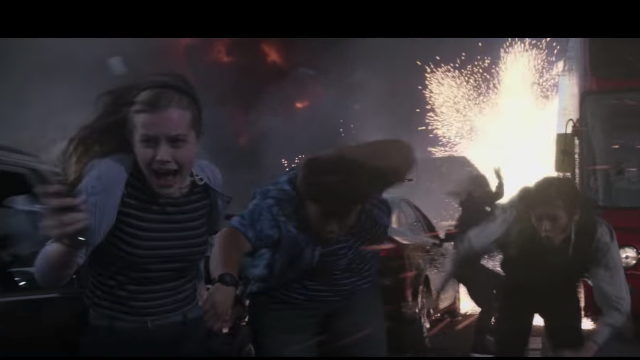 Note that Betty and Ned are holding hands here, providing further evidence that the two might be romantically involved in the movie. Here we have our best look yet at Peter’s stealth suit. 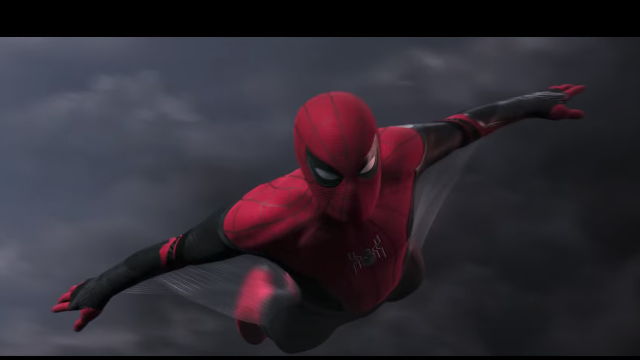 The retractable eye pieces are a really cool touch, but just like Peter’s new red and black duds, the exact origin of this suit is unclear. We can also see both Fury and Maria Hill in the background, which confirms Cobie Smulders’ return to the MCU after her character succumbed to Thanos’ snap in Avengers: Infinity War. 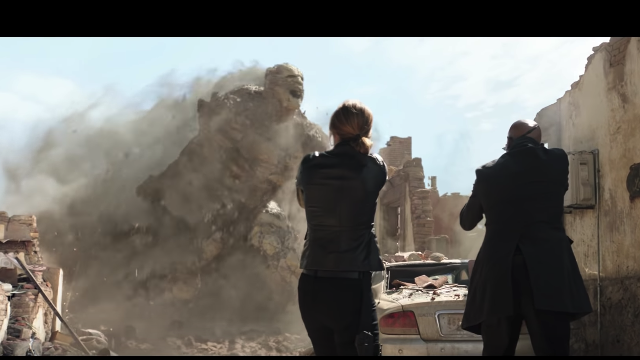 The first Elemental to show up in the trailer is a rock-like monster reminiscent of Sandman. In Marvel’s comic universe, the Elementals were a team of extradimensional beings who could harness the power of natural forces, and Magnum was the member who could manipulate rocks and minerals as he saw fit. Also notice the presence of Fury and Hill in the foreground of this shot. Obviously, bullets don’t seem to be having much of an effect on this creature. This shot seems to concentrate on Zephyr, the wind Elemental. 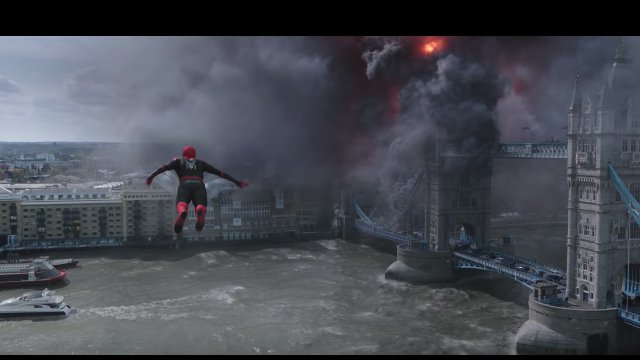 However, London’s Tower Bridge seems like it would be a good place for the team to combine their abilities and cause an extra bit of mayhem for Spider-Man to deal with. 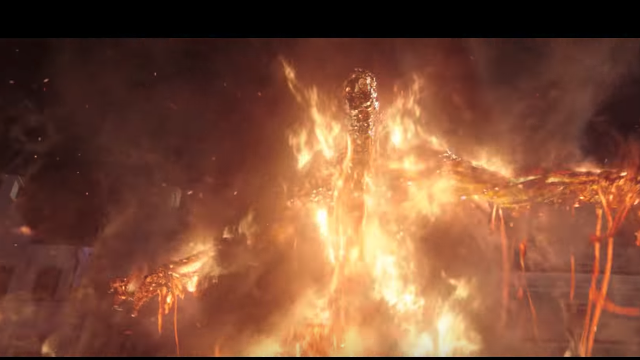 Here, we get a look at what appears to be Hellfire, the flame Elemental, and his oblong shape gives credence to the theory that these beings aren’t superpowered humans, but illusions crafted by Mysterio. 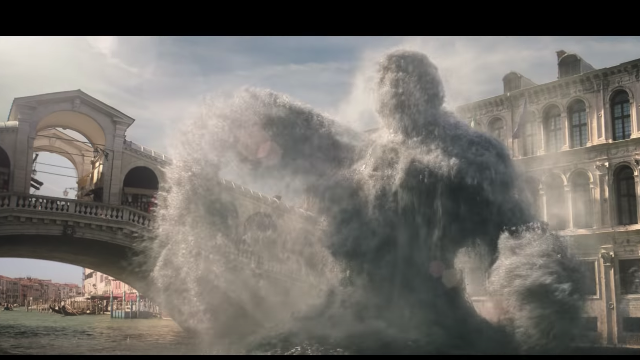 Unfortunately for Peter, the film’s water-based Elemental (known as Hydron in the comics…or is this a take on Hydro Man?) decides to attack him out of costume. So either the team has discovered his secret identity or, like many times before, Peter just happened to be in the wrong place at the wrong time. At long last, Jake Gyllenhaal’s Quentin Beck, a.k.a. 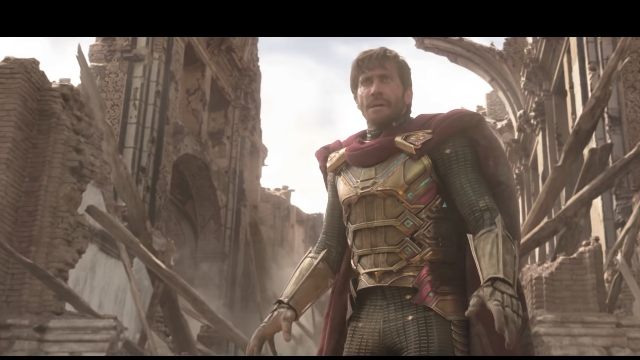 Mysterio, makes his cinematic debut. The character has always been one of Spider-Man’s most prominent adversaries, so the fact that he arrives to save the day is an interesting change of pace. It’s worth noting that the odd shapes emanating from his hands look similar to Dr. Strange’s spells. 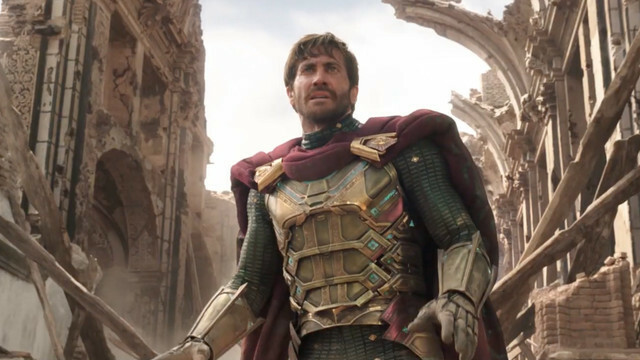 Could Mysterio have based his costumed persona on other MCU heroes? Whatever the case, it’s a pretty cool reveal. 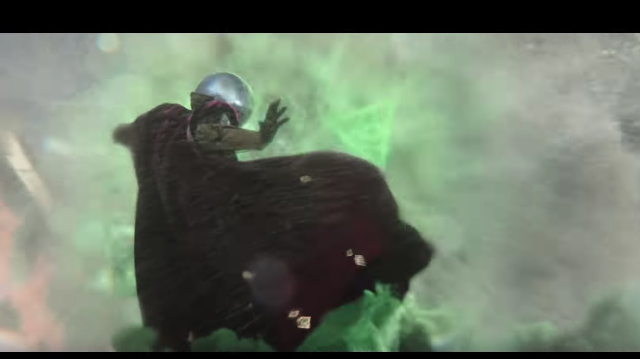 Here we get a big, sweeping shot of Mysterio sporting his classic fishbowl helmet while he fights the unnamed water creature. 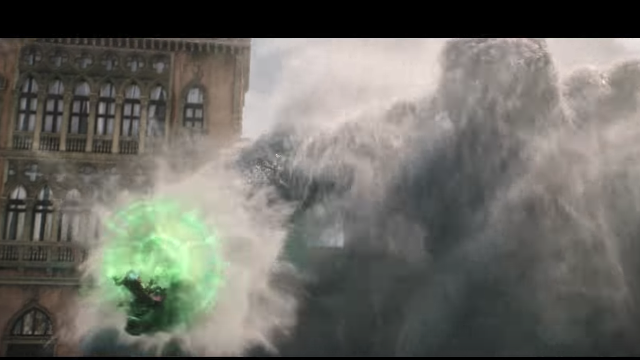 In the comics, Mysterio uses his experience as a special effects whiz to give the impression that he has superpowers. 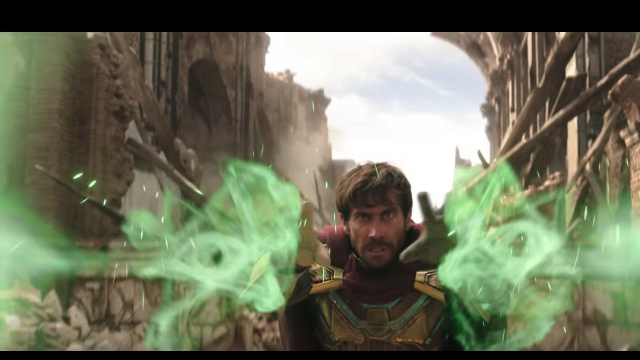 So far, the filmmakers have done a good job of translating the character’s trademark green smoke to live action, and it’s clear that Gyllenhaal’s version of Mysterio has something to hide here. 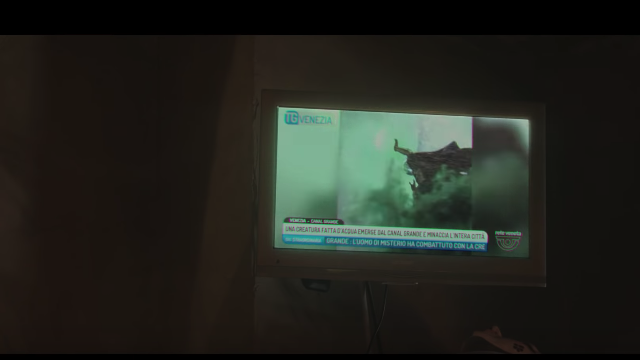 After the title card, we see news footage of the very same battle where Mysterio made his grand entrance. 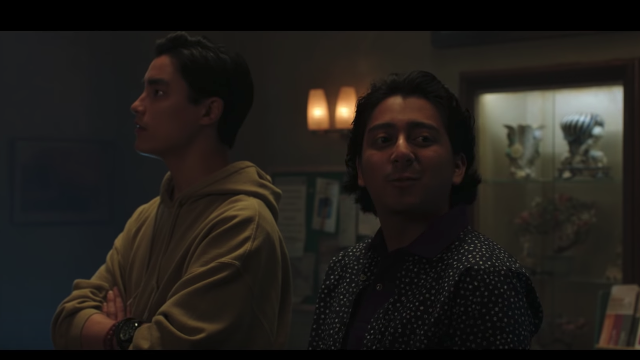 Because Peter’s classmates are heard asking about Mysterio’s identity, this implies that the previous action scene happens relatively early in the film, possibly in the beginning of the second act. This shot of the group watching the newscast gives us a great look at everyone who came along on the trip, including new cast member Remy Hii on the far left. Once again, note Betty’s hand placement, along with two characters in the background who appear to be hotel employees. The trailer closes with an amusing exchange between MJ, Flash, and Peter. 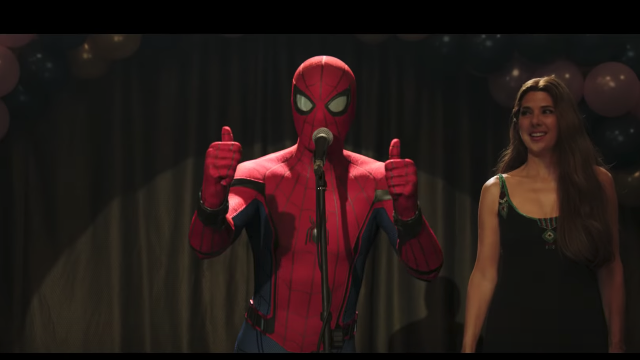 In the comics, Flash’s contempt for Peter and idolization of Spider-Man always gave readers a good laugh, and hearing him call Peter a “dickwad” immediately after singing Spider-Man’s praises is sure to elicit a similar reaction among moviegoers. 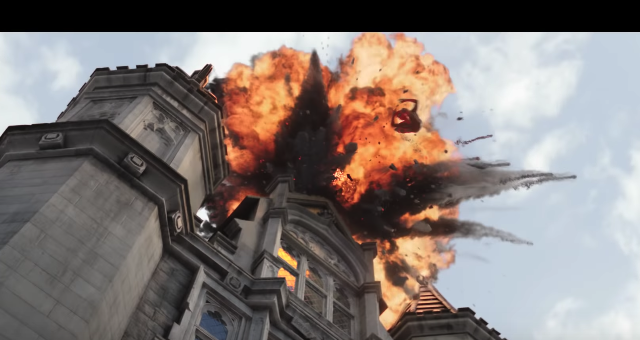 What are your thoughts on all the details shown in the Spider-Man: Far From Home teaser trailer? What are you most excited to see in the film? Be sure to let us know in the comment section below!